The following article by SGS President Cal Hackeman was published in the June-July 2018 Issue of the National Depression Glass Association newsletter News & Views, Mark Buersmeyer, Editor. We would like to thank the NDGA for allowing us to repost the article. Colored glassware of the Depression era was produced during the late 1920s and into the 1930s; some authors and researchers extend the timeframe even longer, at least into the 1940s. It was made by many glass companies over an extended period of time and included a never-ending array of shapes, sizes and colors. Have you ever thought about what types of glass were available to shoppers just prior to ‘Depression glass?’ In this article, we are going to look at one of those ‘older siblings’ of Depression glass – iridescent stretch glass. Around 1912, The Imperial Glass Company marketed some NUART lampshades with a “crizzled” effect on them. They are included in what we call ‘stretch glass’ today, but the widespread production of ‘stretch glass’ did not begin until 1916. Iridescent stretch glass made its debut that year in fine gift shops and other retail establishments where consumers shopped for the latest in giftware and, in particular, colorful glassware. They found a new, not previously produced, type of glassware – “Rainbow Glass” or “Florentine Ware” that was different from anything else on the market at the time. Prior to 1916 the world had been focused on what would become known as Carnival glass – a bright, shiny, heavily patterned colored glassware designed to brighten up the dark rooms of Victorian houses. Carnival glass was preceded by Victorian glass, early American pressed and blown glass tableware and accessories dating back to the 1820s when the manufacturing of glass tableware in America began. Color has always been a key marketing element for glassware. It was no different in 1916 and 1917 when Northwood and Fenton introduced “early period” stretch glass in a host of colors including various blues, greens, topaz, pink, crystal, orange, purple and more. Stretch glass would continue to be made for approximately the next 16 years during which the range of colors would expand to over 50, covering the entire color spectrum from black to white and everything in between. Stretch glass would reappear in the market in 1980 as part of Fenton’s 75th anniversary line which included “Velva Rose” stretch glass, reviving a popular color from the early stretch glass period. 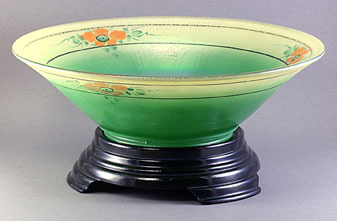 Stretch glass would continue to be offered by Fenton periodically during the remaining 30+ years of their existence in a wide array of new colors as well as the early period “Celeste Blue,” “Velva Rose” and “Ruby.” This “late period” stretch glass was often produced in new shapes and was generally marked in the glass by Fenton. Sadly, stretch glass is no longer being produced. Let’s take a look at what makes stretch glass unique. Stretch glass is a pressed or blown-molded glass that has little or no pattern; it was sprayed with a metallic salt mix after being removed from the mold but while the glass was hot; then it was reheated and usually reshaped (more on that in a minute). When stretch glass is finished, it has either a cobweb iridescent effect (that is “stretch marks”) or a satiny iridescent effect. This finish is achieved by reheating the glass after it is iridized and, in some cases, by reshaping the hot, iridized glass. In both cases, the iridescence and the glass are expanding at different rates, causing the stretch effect in the iridescence. Certain items such as candleholders, lidded jars and perfumes were not reshaped but they were re-heated. These items are still considered stretch glass because they were made during the same time period and were in the production lines of the companies making stretch glass. Stretch glass and carnival glass production overlapped in the early 1920s before stretch glass began to dominate the iridescent glass market. Who made stretch glass? To date, we are aware of nine American glass companies that made early period stretch glass (1916-mid-1930s). The companies were: Central Glass Works (Wheeling, WV), Diamond Glass-Ware Company (Indiana, PA), Fenton Art Glass Company (Williamstown, WV), Imperial Glass Company (Bellaire, OH), Jeanette Glass Company (Jeannette, PA), Lancaster Glass Company (Lancaster, OH), H. Northwood & Company (Wheeling, WV), United States Glass Company (at Factory K – King Glass, Pittsburgh, PA and Factory R – Tiffin Glass in Tiffin, OH) and Vineland Flint Glass Works (Vineland, NJ). Of these, only The Fenton Art Glass Company was in business to make late period stretch glass (1980-2010). Let’s look at some of the glass these companies were making during the two timeframes. Central Glass joined the stretch glass party in the 1920s. In a 1924 Central Glass Works ad, they feature trumpet candlesticks and a flared console bowl. They are described as “in Satin Glass.” It is likely this is the term they used for stretch glass (the term ‘stretch glass’ was coined in the mid-1960s by carnival glass enthusiasts attempting to distinguish it from the ‘other’ iridescent glass, which did not typically have the stretch effect). These trumpet candlesticks and bowl are known to exist in both stretch glass and crystal translucent glass in various colors. The non-stretch sets were produced during the Depression era and are no doubt familiar to DG enthusiasts. Diamond produced one of several stretch glass lines which had a pressed pattern. Typically stretch glass is either plain, i.e., smooth / no pattern, or it has ‘optic’ patterns. An optic pattern is one which is viewed thru the glass, thus the pattern is pressed inside the bowl or on the underside of the plate, so that the surface of the glass as it is seen is smooth and the impact of the pattern is seen thru the smooth surface. Diamond varied from this approach and created “Adam’s Rib” which had narrow ribs on the exterior of the bowls, candy jars and candlesticks. The ribs still appeared on the underside of the plate for obvious reasons. Adam’s Rib was revived in the Depression era and the variety of items available in the pattern was increased at that time. It is well known and documented that Fenton re-used molds to make the same item with various finishes. There are many identical (or very similar) bowls, candlesticks, vases and other items which can be found when comparing stretch glass to the other lines of glass they made, including some in the Depression era. However, it is important to note that dinnerware sets were never produced in the early stretch glass period. There were only luncheon or tea services, berry/salad sets or beverage sets available in stretch glass. The luncheon plates, sherbets and underplates are common today; cups, saucers and bridge goblets (footed tumblers), which would have been available in the 1920s and 30s to complete the luncheon sets, are hard to find today. Stretch glass was clearly intended to accent the dinner table, not replace the family’s china and stemware. The Lincoln Inn, Plymouth and Big Cookies lines of depression glass do not, for the most part, appear in early period stretch glass. But there are exceptions: stretch glass baskets are known in both Plymouth and Big Cookies. They were apparently made in limited quantities (or suffered high rates of breakage) because they are extremely rare today. For example, only 3 or 4 Big Cookies baskets are known and even fewer of the Plymouth baskets have been recorded. Lincoln Inn molds do not appear to have been used during the early stretch glass period but a few molds were used during the late stretch glass period to produce Celeste Blue water sets. A few other stretch glass samples are known, including this Velva Rose sugar, which has the Fenton oval logo mark, confirming that it was made in the late stretch glass period. Imperial also reused many of the molds it utilized to produce stretch glass. A couple of examples are their “Chesterfield” water sets and the renamed (but same molds) “Packard” console sets (the “Packard” mold had previously been marketed as “Double Scroll.”) Imperial’s swung vases appear in abundance in Depression era catalogs as do some of their candy jars. Both of these were made during the early stretch period and are popular with carnival and stretch glass collectors today, as are the Chesterfield water sets. The center handled server design seems to have carried over from stretch glass to Depression glass, as did the baskets, bowls and some other candlesticks. At Imperial, maybe more than at any other company, stretch glass is not only the older sibling, but one who looks very much like the younger one from the Depression glass era. Jeanette seems to have created new molds for their Depression era glass rather than re-using the molds from the early stretch glass period. Some of their depression era glass was iridized but I have not seen any of it with a stretch effect. Jeanette’s early stretch glass line was not extensive. It consisted of fewer than 10 shapes of bowls, a comport and 2 sizes of center handled servers (both with a “shovel” handle). They also did not produce a wide variety of colors. Most of the Jeanette stretch glass we find today is marigold or light marigold in color and is most often a bowl. However, stretch glass by Jeanette is also known in green, purple, cobalt and crystal. While I have not had access to an extensive number of Jeanette catalogs from the Depression era, the ones which I have examined do not contain items of similar shapes to the items made in stretch glass. Even the handles on the center handled servers from the two eras are different. Lancaster, on the other hand, does seem to have re-used some of its extensive line of molds used to make stretch glass. In particular we find depression era candy jars which are identical in shape to ones made in stretch glass. But again, the handle of the center handled server has been re-designed. Lancaster was acquired by Hocking in 1924 but continued to produce stretch glass into the 1930s. They made many etched and fancy serving pieces in Depression glass, much different from their line of stretch glass. One element of their stretch glass did carry over into their later offerings: painted decoration. Lancaster was the most prolific of all the stretch glass producers when it came to applying color and/or decoration to their stretch glass, which was typically crystal glass enhanced by paint or colored iridescence. US Glass once again re-used molds from the early stretch glass era in their Depression era products. Their plates and bowls with reticulated (ribbon) edges were made during both periods as was Line #310 for which we have no other name. 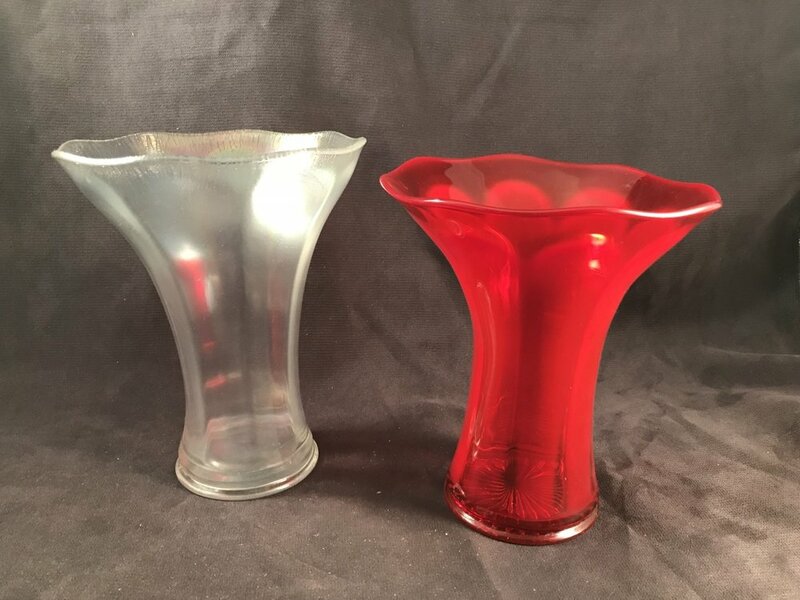 A few other vase molds seem to have been re-used as we see similar items in stretch glass and colored glass from the depression era. It is interesting that the “Galleon” ashtray mold is identical to an ashtray made during the early stretch period except that the stretch glass example does not contain the impression of the ship and does not have a name associated with it. US Glass apparently utilized new molds rather early in the Depression glass era and well before the end of the early stretch glass era. We see luncheon sets and kitchenware appearing in their advertisements in the late 1920’s. These items have no similarity to the extensive line of stretch glass they produced. Finally we get to Vineland Flint Glass Company of Vineland, NJ. Vineland produced a very limited line of stretch glass consisting of bowls, candlesticks and vases. They did introduce some colors which were different from those used by the other stretch glass companies and they have the distinction of, apparently, having had the least quality control over their color mixing of any of their competitors during the early stretch glass period. As a result we find many variations of what appears to have been an intended color. Vineland created the Durand Art Glass Division in 1924 and produced beautiful iridescent art glass. Art glass is not stretch glass (it is not molded glassware) but it is Depression era glass because of the timeframe in which it was made. In the limited research I have been able to do, I do not see any of the early stretch glass molds being used for their Depression era colored glassware. Stretch glass molds, as we have seen, were ideal for later period production because they were, for the most part, without patterns and easy to use. Indeed, The Fenton Art Glass Company would periodically re-use their own molds – and the molds of other companies which they acquired – during the 100+ years in which they were in business. Their dolphin handled glass, originated during the early stretch period (most likely based on Boston & Sandwich dolphins from the 1800’s), would be made again and again, sometimes in crystal glass, other times in opaque glass and finally after 1980 in later period stretch glass. A similar pattern might have existed for the other early stretch glass era companies had they also survived into the 21st century. I hope you will agree that there are enough similarities between early stretch glass and colored glass of the Depression era to conclude that we are indeed, more like siblings than kissing cousins, at least to the extent of 8 glass company ‘parents’ and their hundreds of molds. I have found, and maybe you have also, that colored glassware from the Depression era and stretch glass work well together in all settings. If I am missing an item in one but have it in the other I don’t hesitate to mix and match on our table or elsewhere in our home. Both periods produced a vast array of specialty items in a wide array of colors designed to enhance homes and tables of the period. The colors of the glass are in many cases nearly identical and with so many similar shapes, the two types of glass are naturals to be collected, used and admired together. Both types of glassware have been widely researched, collected and admired by several generations. In short, we, the collectors of Depression era colored glass and stretch glass, are joined at the hip.